The CHOReVOLUTION Studio is an Eclipse-based environment providing automated support to business users, DevOps teams and service providers. It helps them composing new dynamic applications out of existing services and things. The first use cases are related to Urban Traffic Control and Smart Tourism. CHOReVOLUTION has received funding from the European Union’s Horizon 2020 research and innovation programme. 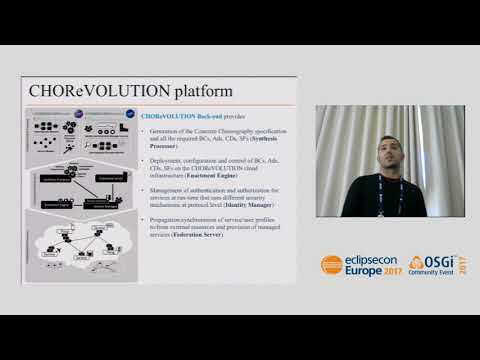 This presentation was provided at EclipseCon Europe 2017 by Claudio Pompilio, Alexander Perucci from the University of L'Aquila, Italy.